A roof is quite a harsh environment. It is exposed to the sun, wind, rain, frost, snow, birds, moss and algae to name a few things a roof has to cope with. So whilst a whole roof can last a lifetime or more, individual tiles can suffer cracking or breaking. An individual failure of the tile or slate which has caused the nibs which hold the tile to break off or the nail holes in the slate to break. Corrosion of the nails which hold the slates in place. Nowadays copper or stainless steel nails are used but historically nails with lower corrosion resistance were used. Widespread failure of slate nails is know as ‘nail sickness’ and generally requires a full roof refurbishment. A sign of nail sickness is if the bottom edges of each row of slates are not in line with each other. Rotting of the wooden lath (batten) which the tiles /slates are fixed on to. This could be localised to a small area which is not properly protected from the elements or it could be a wider problem. Modern roofs use tanalised wood battens but older roofs may use untreated wood which is more prone to rotting. Corrosion of the nails which fix the batten (lath) on to the joists . These sorts of problems can only be accurately diagnosed by inspecting the roof to establish the cause. Strong winds or extreme weather conditions can cause slippages and the judgement has to be made as to whether this is a one off event or whether the same failures are going to be repeated year after year. Where inferior materials have been used then it is probably only a matter of time before more problems are encountered. If its purely a problem with a couple of failed slates or tiles then these can just be replaced. 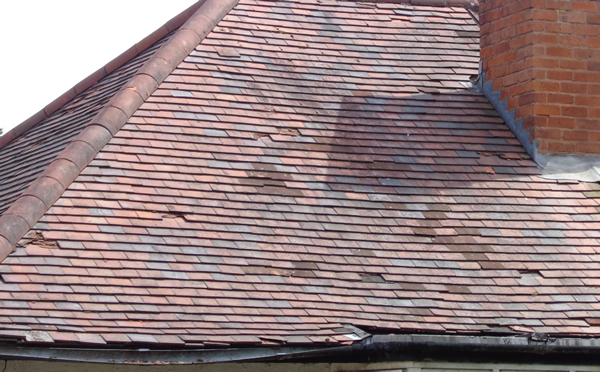 If a number of slates or tiles have slipped then re-roofing may be a better option. So what will replacing roof tiles cost? Well as a guide most professional roofing companies charge around £160 / day for an expert roofer and £100 / day for a roofing labourer. Many of them will not consider working without an access tower except under very accessible conditions. See Safe Working On A Roof for guidance on working on a roof. £130 labour (2 people for half a day). Most of the labour in this sort of job is delivering the access tower, putting it up and taking it down. For this price you would expect the roofer to find a good match to the roof for the replacement tile or slate. For a single storey building where scaffold access is not required, then £75-£100 would be a more typical cost. As a rough guide to the material costs a typical Welsh slate (which most people think is the best) will cost around £4 for a 500 x 300mm slate. For cheaper sources (Spanish / Chinese / Brazilian) this can drop to nearer £1. A clay tile of 265 x 135mm will be around £0.50 and a concrete tile of the same size slightly cheaper. Copper tingles used to retain replaced slates will be about £1 for a pair. The labour time for replacing a simple clay tile will probably be under 5 minutes. Generally it just involves slipping the broken tile off the wooden batten and pushing the new tile into position, ensuring the nibs are locked onto the wooden battens which retain it. For a slate it will be slightly longer. The old broken slate will have to be removed – this involves using a slate ripper to remove the old retaining nails. The new slate, matching the rest of the roof, is then slid into place. There are various techniques for retaining this slate. A hole can be punched, using a slate hammer or a slate hole punch tool, into the slate so it can be nailed between the vertical joints of the two slates above. A copper bib (a 20cm x 7.6cm length of copper) is then added. Alternatively two lead or zinc strips known as tingles can be used to retain the slate. Bear in mind that repairing slate roofs with tingles leaves a visible sign on the roof of repair work. When time comes to sell the house, a surveyor of a potential purchaser will sometimes assume that the visible tingles are a sign of a wider problem and that the roof may need replacing. Some stone or older slate roofs historically used wooden pegs which held the slates on the battens in a similar way to clay tiles. Torching (lime mortar) is then used to secure them in place. Matching the replacement tiles /slates to the existing roof is worth considering. Very often reclaimed materials (which tend to cost more) may need to be used if it is an older roof. £1,400 – Materials including breathable membrane, roof battens and clay tiles. This figure may reduce by 20-40% if some of the existing tiles are in a good enough condition to be reused. Within this figure is a £200 allowance for lead. Clearly replacing one face of a roof will be cheaper than a complete re-roof but if the rest of the roof will need replacing in the next few years then it is more cost effective to get it all done at once. 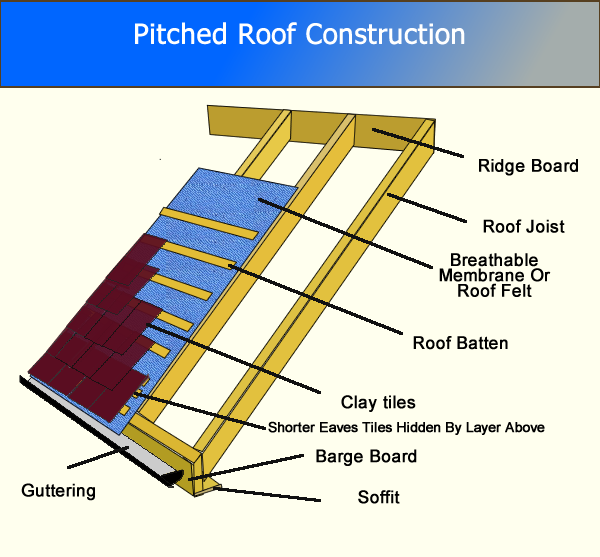 The diagram above show what makes up a rebuilt roof. If the roof requires refurbishing then the existing tiles or slates including ridge tiles will be removed along with rotten wooden battens and any underlay or torching until just the wooden rafters remain. Then a new structure is built similar to that shown in the diagram. A new breathable membrane is added and new tanalised wooden battens nailed onto the rafters using stainless steel or galvanised nails. Clay and concrete tiles are either retained using nibs moulded into the tile which sit on the wooden batten or using nails. Slates are nailed onto the batten with copper nails or wooden pegs . The ridge tiles are then bedded down with mortar. Depending on the insulation requirements, insulation can either be added between the roof rafters or laid on the floor of the attic. If more than 25% of the roof is replaced then there is a requirement under building regulations to introduce certain levels of insulation (which will reduce heating costs). I have an old cottage with a clay tiled roof. Just one tile has slipped near the ridge and I have a spare tile. Can I do the repair from inside the roof space which is very accessable. It looks as though I could cut the felt and maybe slip a new tile into place from the underside. Is this possible please?